As the Fall Colors reach their peak in the lower elevations this week and next, think about a trip with the kids to Parrot Mountain. The name alone ought to get their attention. One thing’s for sure, when you get there, it’ll grab your attention. Don’t be surprised if you never want to leave. Parrot Mountain and Gardens is nestled above Pigeon Forge close to Dollywood and Splash Country, in four acres of landscaped gardens. It’s a bird sanctuary that’s home to hundreds of exotic birds, plants and flowers from around the world. 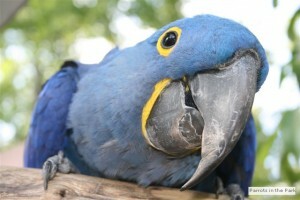 But at Parrot Mountain, you can actually hold these birds and play with them. You can spend the whole day at Parrot Mountain, exploring the gardens, paths and nurseries, against the backdrop of the Smoky Mountains. You come across exotic birds everywhere, sitting on branches or a fence, or hopping across a lawn. Some of the birds live in unique cages like little cottages. Most of them seem to fly freely around the area. They’re all eager to meet YOU. Don’t be surprised if you find a colorful toucan walking up your arm and shoulder as if to say yes, he is hungry, and please feed him. At Parrot Mountain and Gardens you can meander as much as you like, as long as you like, to take in the birds and scenery. Follow the paved pathway leading to the little yellow door that’s the entrance to a beautifully tended “secret” garden, home to all kinds of tropical birds. Toucans, magpies, silvery-cheek hornbills, and more, all flying through the air above you. Outside of the secret garden is a bird garden with more than 70 species of birds with brilliant plumages, resting on open perches. You can feed them with seed from your hand, and take pictures with them – DON’T forget your camera! Actually video with sound would be the best way to capture all the different calls of the birds. There’s an aviary teeming with small to medium-sized, garishly colorful tree-birds called lories and lorikeets. They’re very friendly to visitors, and you can feed them nectar from a cup in your hand. Just outside the aviary is a scenic waterfall area, home and hangout place for a brilliant population of peacocks, butterflies and dragonflies. Parrot Mountain is also home to a baby-bird nursery where you can pet the babies and watch them be fed. You can even choose one to take home with you! Parrot Mountain is dubbed the largest eco-tourist park in the Southeast, and comes even more alive in the Fall, as its own hundreds of trees combine with the Smoky Mountains all around in a blaze of colors. When you’re at Parrot Mountain and Gardens take the time to linger over the sanctuary’s casual lunch, and make your plans for how soon you can come back – again and again – for this unique experience.